Versatile entertainer, Terry G aka 'HIT MAN,' was born in Lagos, Nigeria on the 17th of March. He is the first child in a family of four. A very talented and successful entertainer, instrumentalist, singer and music producer. But this is one artiste that is yet to get an endorsement from any brand despite his popularity in the entertainment industry. The development of his unique style called ''chante chante'' is the result of a lifetime of musical influence. Growing up in a talented musical family meant that Terry G was surrounded by different forms of music. Until recently, little has been known that Terry Gsus as he is fondly called received an endorsement from Mama Peace (Dame Patience Jonathan). 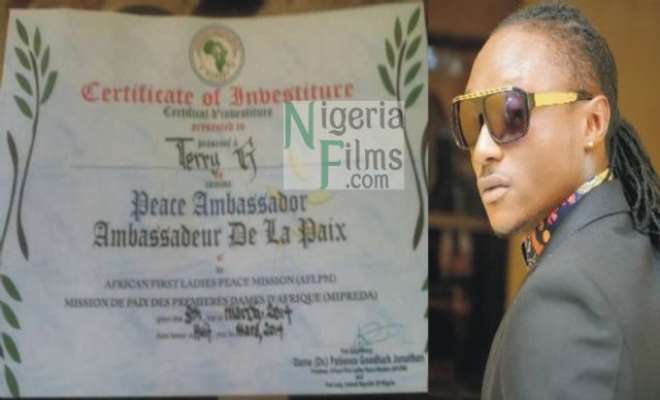 Other artistes endorsed alongside Terry G, were Sammy Okposo, and Kcee, were made peace ambassadors.